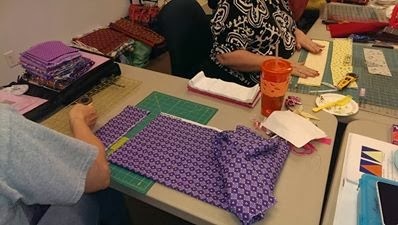 I thought I would record the status of my Celtic Solstice that I am adapting into 2 twin size quilts for my 7 year old twin granddaughters. It's about 2 months after the release of the final clue and I am finally getting close to getting the flimsy all together. The quilts are a surprise for the twins but I am fairly certain that they don't read my blog so I feel safe sharing :). I will add another row to one and 2 rows to the other, plus the borders, but I couldn't wait any longer to see it put together. Plus, this gives me some time to check for errors in layout and adjust the blocks to reduce some of the side-by-side fabrics where possible. I am sure I am the only one that is this anxious to see them but please bear with me!! You may not immediately notice that, while the exact same fabrics have been used in both quilts, the 2 quilts are, in fact, different. In the photo below, you will see that the sections of the first block that is at 12, 3, 6, and 9 on the clock are flip flopped in the 2nd block. Flipping these sections made a slight difference in the quilts and with the different border and binding that I will use on each quilt, the girls will have similar, but different, quilts. To stay on schedule, I am giving myself about 2 weeks to finish the remaining blocks and get the borders on the quilts. Then on to the longarm!! I will post each flimsy as I get it done. Stay tuned!!! Finally, the quilt is starting to take shape. However, I have decided to alter the original size of KING to 2 twin size quilts... I am making them almost identical for my twin granddaughters and hope to get them completed by April 1 They have a slightly different layout and I plan to use different borders for them. This will be the first quilt for each of the girls... I have been remiss in keeping up with the births of the grandchildren and getting their quilts made. As the fans of the Chicago Cubbies are often heard to say, "This is the year!!" These quilts are each about 1/2 pieced into blocks but I am going to take a little break from these quilts for a bit and work on some other things. I am anxious to get these done by April so I can deliver them when I see the girls next!!! Make a commitment to do something that's been on your list for a long time..... get it done and cross it off!!! I haven't felt well lately so I haven't been keeping up on things. 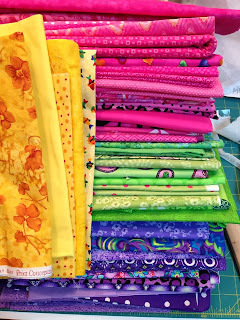 While I am still not 100%, I am going to take a stab at catching you up on the life of my Celtic Solstice quilt... although I think I will have to change the name. There just isn't enough green and NO blue to support the name. Step 2 was a tough one but I FINALLY got them done. Since it was scrappy and I was using bits and pieces left from other projects, I left about 20 uncompleted just in case I needed to add fabric later... then I could include that new fabric in these blocks too. I will admit that at this point, I wished I had chosen different colors. We were traveling when Step 3 was released and as I didn't have my Easy Angle with me and DID NOT want to buy another ruler, I waited until we were home to do them. Step 4 was completed in good time... at least, once I started it. Again, I left a few undone in case I needed to add fabric later. At this point, I couldn't resist laying the 4 completed blocks out together. I was a bit concerned. I still didn't know what the end product would look like and I couldn't imagine this going well. Still, I kept plugging along. I set myself to complete Step 5. These blocks went together much better than anticipated... so YAY!!! They were cute but not exciting and I was seriously losing my mojo on this quilt. I love the colors... I love the contrast... but is this going to make a good quilt? I trust Bonnie's patterns and color suggestions implicitly so I kept calm and quilted on!! The final step was the big reveal and while my blocks are not yet all completed, I had enough to put 1 of each of the 2 final blocks together. A very nice lady processed the projection of the completed project and here it is!!! I am very pleased and its all going to be just fine. I needed to have more faith. I guess. 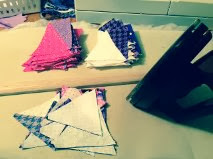 I will adjust the blocks to make 2 twin sized quilts for my twin granddaughters. 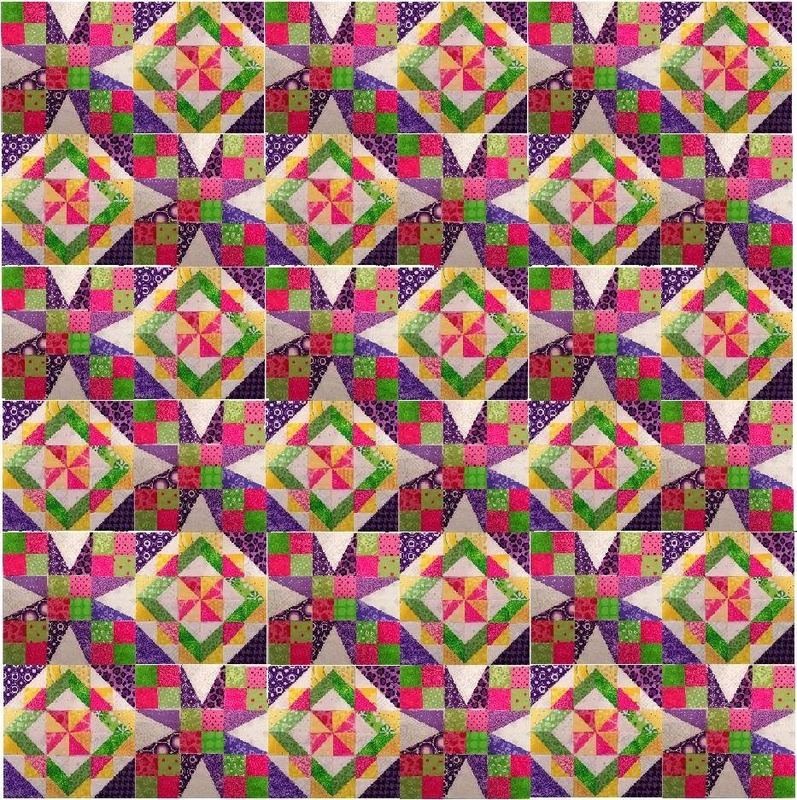 I will alter the borders so that while the quilts will be virtually identical, they will still reflect some individuality. Now if I can just get them done.!!! 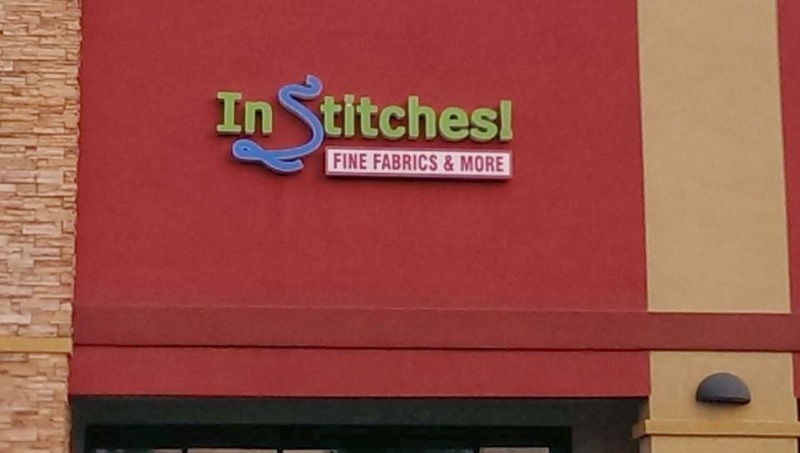 Are you ready for some SEWING? I was finally able to settle down yesterday and finish step 1 of the 5 already released clues for the quilt. 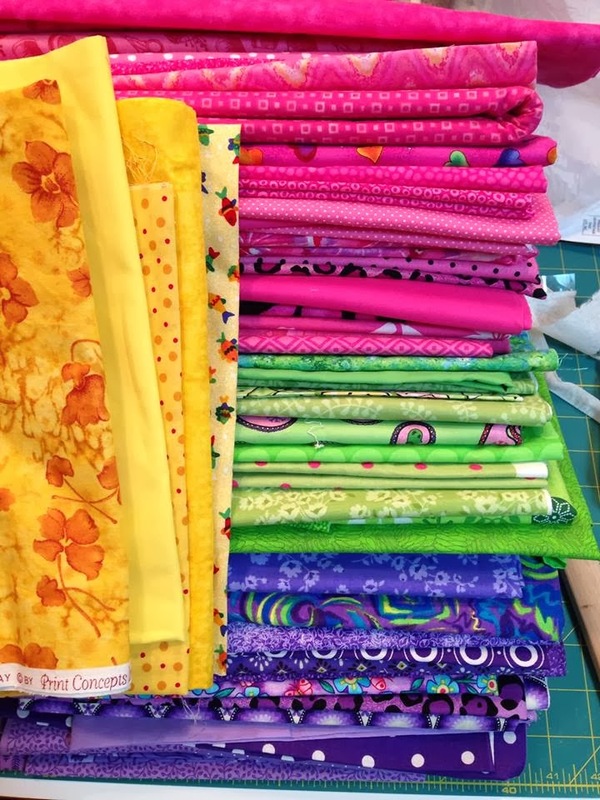 I am understanding from my mathematically blessed quilting friends that we (it would be "we" if I were caught up) are currently up to about 2200 pieces in this quilt and still more cutting, sewing, and more cutting and sewing to do. These are a sample of the 380 blocks required to complete step 1. I elected to work on a king sized quilt. HA! but I really believe that I will be glad I did. I love big quilts. The entire color palette is shown in an earlier entry on this page. I purposely left a few unsewn in the event that I run out of the wing color. 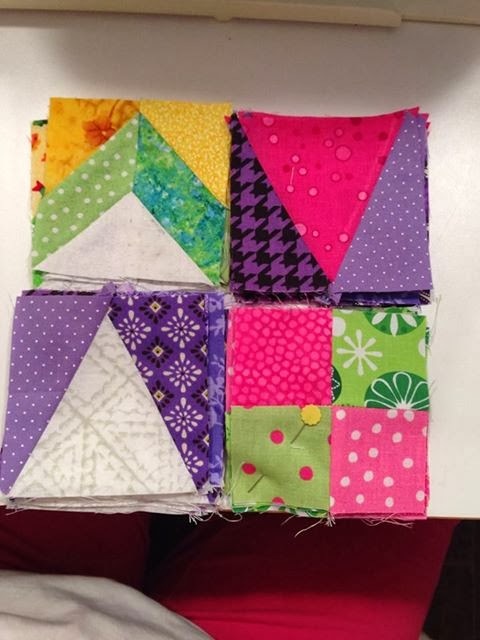 If I have to add another fabric, I can use the new fabric to complete the remaining step 1 blocks, which will allow the new fabric to spread a little better over the quilt.... and THIS is one of the joys of doing scrappy quilts!! Clue 2 involves chevron blocks... 244 of them. I have about 75% of the cutting done for the chevrons and about 1% of the sewing. The blocks shown below are not complete chevrons as there will be yellow added to each block shown and then joined with a partner block. Hopefully tomorrow, I will show you some completed chevrons!!! Keep Calm and Quilt On !!!! 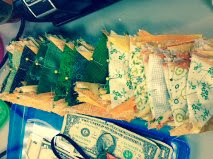 As some of you may know, I am participating again this year in Bonnie Hunter's Celtic Solstice Mystery Quilt which comes around but once a year. A group of friends and I are pretty die hard Bonnie fans and we take every workshop available in our area. You just never know what surprise tip or trick you may pick up at the workshops. In addition, Bonnie is THE most helpful, caring teacher. She is truly concerned about the promotion of quilting and the success of each and every quilting student, friend, and acquaintance. You can find information about Bonnie Hunter and her mystery quilts at http://quiltville.blogspot.com/. 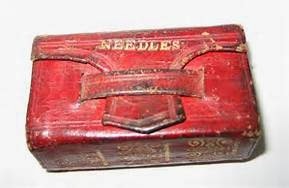 My quilting buddies, who sometimes refer to ourselves as the Knotty Kneedles, look forward to Mystery time as though it were a national holiday!! 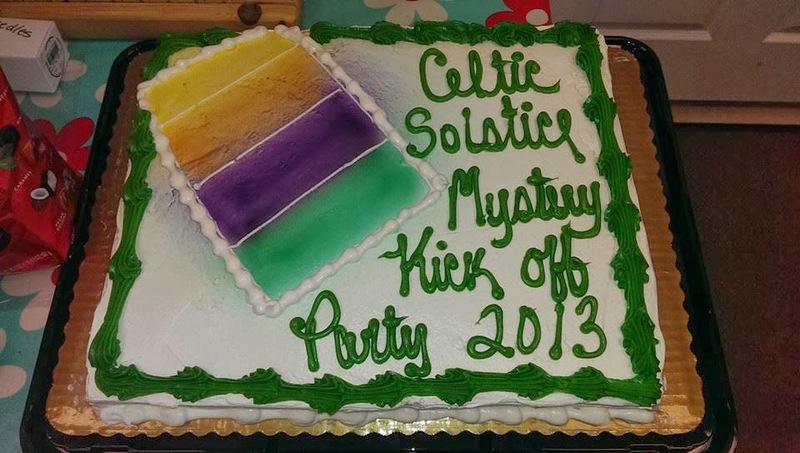 However, I somehow managed to be extremely unprepared for the mystery this year. What to do? As is often so, the answer to my question was right in front of me! I went to my stash, pulled out the 2 colors that seem to dominate the space in my stash storage, then went to the color wheel to find 2 coordinating colors. These are the colors of my quilt-to-be, with the addition of white, of course. A few have been added... a few have been removed... but my colors have remained the same. Bonnie publishes the clues weekly on Fridays beginning right after Thanksgiving, so on Saturday after the 1st clue was released, the Knotty Kneedles and a few other friends gathered at the quaint little quilt shop, In Stitches, in Goodyear, Arizona, and worked on our Celtic Solstice clue #1. Jan and her hubby, the owners, even offered a discount to our group and since it was also Small Business Saturday, we were sitting pretty with that promotion too!!! I was a vendor at a craft fair that weekend but took the day off with my DH working the show for me. SO I have my fabric pulled, my hubby lined up to cover for me, my contribution to our lunch ready, and I am sitting pretty. BUT, I woke up not feeling well that morning (my fibromyalgia was acting up) but I arrived late and was still able to join my friends!! I unloaded boxes and totes and food... sit down and take a deep breath. I want a quilt from each and every colorset I see around the table!! And we seriously celebrated the start of the Bonnie Hunter mystery season with a pot luck lunch and even a special cake!! We take our Bonnie seriously! lol Thank you Angela Neff and Kathy Kavanagh for organizing the day!! I worked hard that first Saturday after Thanksgiving but didn't get very far on the clue. I simply haven't had time to work on it as we had extended travel over the holidays. Now that the holidays are on the down hill slide, I have pulled the mystery out again. Even though I am 5 weeks behind, I still plan on catching up and finishing with my friends when the mystery in complete in about 3 weeks. Check back for updates on my progress. I cannot wait to see how this quilt is going to look when finished! 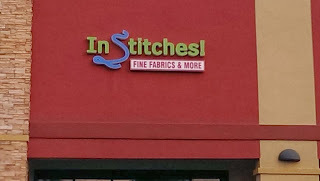 For information about Jan and her hubby's wonderful little shop, In Stiches, in Goodyear, AZ, please click HERE. Thank you Jan, for your graciousness and for allowing us to use your shop classroom space . Some of us were so lucky to have you help with some of the rotary cutting! !